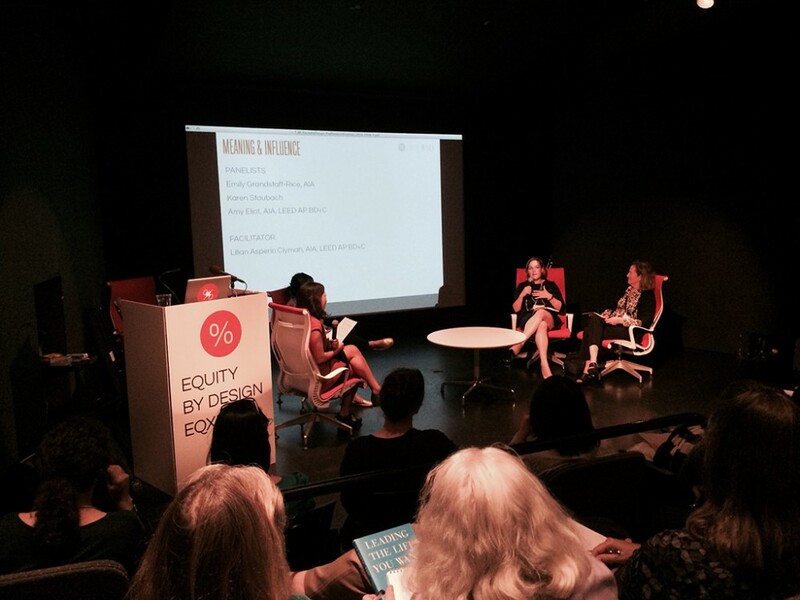 Report from the Equity by Design Symposium | whitespace. 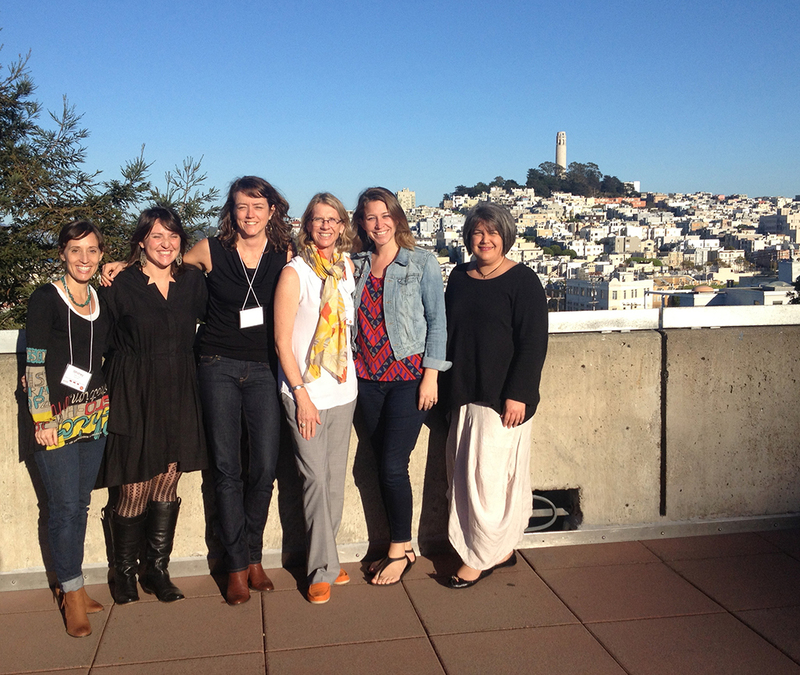 Last Saturday a representative from each Gould Evans office attended the Equity by Design Symposium in San Francisco. 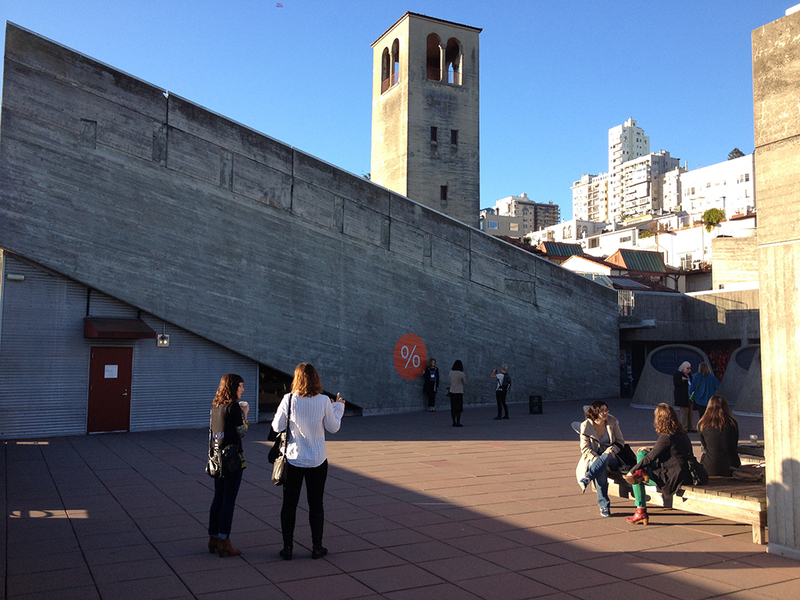 The symposium was hosted by The Missing 32% Project (TM32PP) and the AIASF. We arrived at the San Francisco Art Institute early on a Saturday morning eager and excited to start our day. We were blessed with a gorgeous indian summer day – rare for San Francisco. As we registered, we reflected on how we arrived here in this courtyard gathered amongst 250 of our professional colleagues from across this nation. It seems appropriate before we launch into the team’s experiences of the day to take a step back to discuss why we were all there in the first place and how the symposium came to fruition. 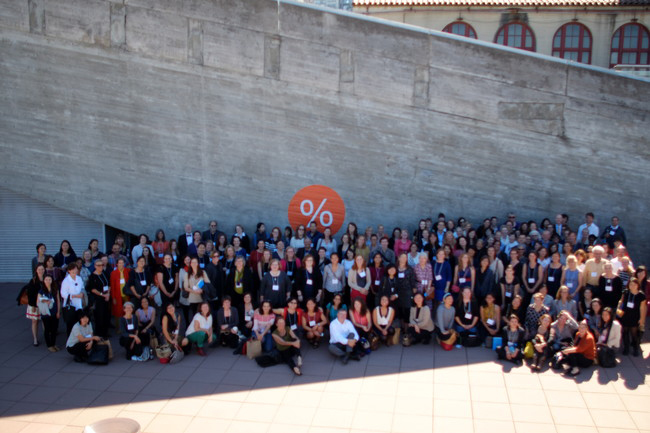 TM32PP is a call to action for both women and men to help realize the goal of equitable practice to advance architecture, sustain the profession and communicate the value of design to society. To understand the pinch points and promote the strategic execution of best practices in the recruitment, retention, and promotion of our profession’s best talent at every level of architectural practice. 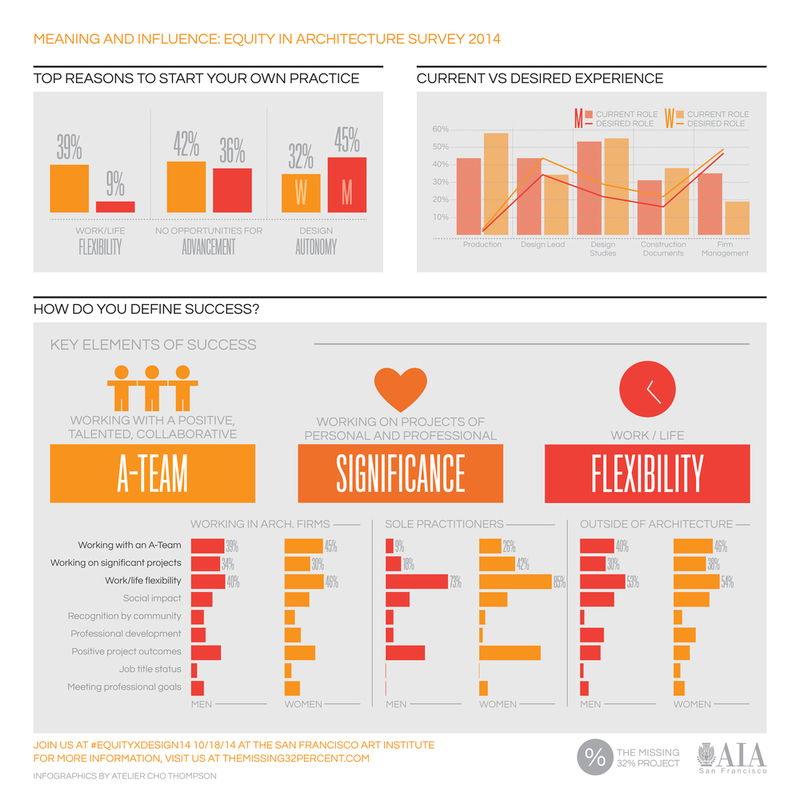 TM32PP launched its first Equity in Architecture Survey this past summer as a study to promote discussion and inspire change within the profession. We had almost 2300 respondents and it reached a national audience. The survey and symposium are both organized around three major knowledge areas: Hiring and Retention, Growth and Development and Meaning and Influence. Recognize the work, not the gender. Our greatest power is our voice! And Equity is for everyone! The Hiring and Retention knowledge session panel discussion addressed the issues of finding talent and how to keep the talent. This is an ongoing issue in architectural practice. The survey results discussed and analyzed job satisfaction, work life flexibility and “pinch points” around major career and life milestones at which women are more likely to leave a firm. These tend to cluster around Hiring, Paying your Dues, Licensure, Caregiving, and the Glass Ceiling. HR1. Finding the Right Fit: Strategies for a Targeted Job or Candidate Search. The “toolbox” was a recurring phrase we encountered when talking about hiring. Employing a “toolbox” means going beyond typical job requirements to take a holistic view of a candidate, including skills (both soft and technical), experience and hobbies, education (both academic and “real world”), client marketability and experience, writing clarity, web presence/social media profiles, etc. Some would say the happiest and most productive employee is one who seeks and gains satisfaction in and out of the office, one with a rich, balanced life that supports professional productivity and influence: one with a full “toolbox.” There is an authenticity to the “toolbox” approach to employee evaluation that does not separate one’s professional self and one’s genuine self: they are one in the same. This panel discussion addressed job satisfaction as key to attracting and keeping the talent. In our break-out sessions, we established the key components of job satisfaction: flexibility, mentorship, sponsorship, transparency and collaboration. We also noted we should be encouraging and recognizing talent more often. In advancement within a firm, the younger audience members expressed that clarity on what it takes to advance is important to them. Careers are marathons not sprints. For happy and productive careers everyone must learn their personal limits. Flexibility in schedules is a benefit which some employees may find is critical to developing their whole selves. Firms experienced with successful flexing noted the following as critical; rewarding efficiency not hours, recognizing that interests outside of work make for more interesting people and flexing requires great time management skills to ensure that work doesn’t get “dumped” on other team members. Are we creating cultures of opportunity? – Damon Leverett (AIA National) identified that science education for 10-13 year old girls is critical. If these young women cannot be engaged at that critical junction, they less likely to pursue careers in science and mathematics, and possibly architecture. He emphasized that the full community needs to be focused not only on sciences but also art and design. Can we make licensure more relevant? 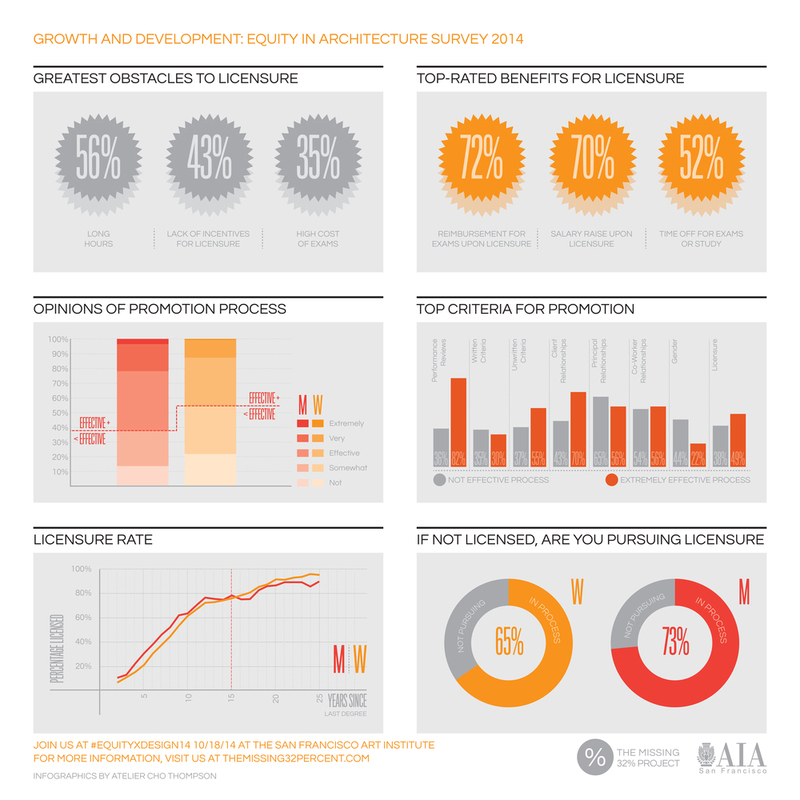 – Michael Armstrong (NCARB) discussed changing requirements for licensure. He received an earful from a disgruntled audience member who has been participating in the licensing process for several decades and remains unlicensed due to exam expiration dates and having to begin the process over several times. It seemed that many listening were nodding with equally frustrating experiences. Are women leaders? – Stefee Knudsen of THA emphatically said YES! As a strong design advocator, interpreter and chief, she noted that we have to break down the notion that women whom speak up for themselves in a leadership role are often perceived as aggressive. How do we change the pipeline? – Jennifer Devlin-Herbert of EHDD offers flexible hours, including 15 free Fridays every year for personal issues and development. She also acknowledged that asking for more flexibility or what you need to do your job best is expected and encouraged. As many of us know, the process of becoming licensed is arduous and complex. As part of this workshop, we discussed what are the changes that are being made to address this issue? Michael Armstrong, the CEO of NCARB, had the following exciting news to share. The total requirement for IDP hours will now be reduced by one third. If you do not pass a test, you will only have to wait 60 days to retake it (not six months). NCARB is developing a program for the collegiate setting that will provide an integrated path to licensure, resulting in a license at the time of graduation. GD2. Collaborative Negotiation is your Power Tool! Laurie Dreyer and Rosa Sheng demystified negotiation using the Thomas Killmann Conflict Resolution Model. The Thomas Killmann model provides five options for conflict resolution: Competing, Accommodating, Avoiding, Compromising, and Collaborating. The model is organized into a vertical axis representing assertiveness and a horizontal axis representing cooperativeness. Each of the five negotiation styles varies on the mix of assertiveness and cooperativeness. It was not surprising to learn that most architects fall into… drumroll please… the Avoiding option of conflict resolution. Avoiding (lose-lose) means you take an unassertive and cooperative approach to negotiating. The second most common architect negotiation style is accommodating. Accommodating(lose-win): taking an unassertive and uncooperative approach or the “split the difference” mentality. Compromising (no win-no lose) is in the center of the model and is both assertive and co-operative. Laurie recommended taking someone with a compromising personality out of their constant environment… maybe take them to a coffee or for a walk. Competing (win-lose) option is a wholly assertive and uncooperative approach. CEOs, CFOs and Owners Representatives typically take this approach to resolving conflict. Sometimes perceived as the “best” style or the “do not back down” approach, it can be at times helpful and at other times hurtful. For example it is not always the best way to retain staff. Collaborative (win-win) is constructive and means that both parties can come out of a conflict winning. Laurie and Rosa encouraged architects to strive to use this tactic for negotiating and remember that empathy and understanding will help you rise out of the conflict. As Amber Evans stated in the introduction to the panel: “Practice, practice, practice negotiation!” Whether it’s with colleagues, a contractor, at the farmers market or at home with your partner… it will get you ready for asking for larger things down the road. GD3. How to Solve the Confidence Conundrum? Change your View, then Change the World. Companies to assess and rebalance salaries on an annual basis for both men and women. Reward employees’ long term commitments. Flexible hours is not the “end-all.” It is ok to ask for more than the standard offering if it’s what you need to do your job properly! Teach negotiation in all parts of work life; provide training. Employees should be “squeaky wheels”; not wait for karma to provide a benefit. Make diversity a value that the company acts upon. Conduct gender-neutral evaluation processes to avoid unintended biases when hiring. 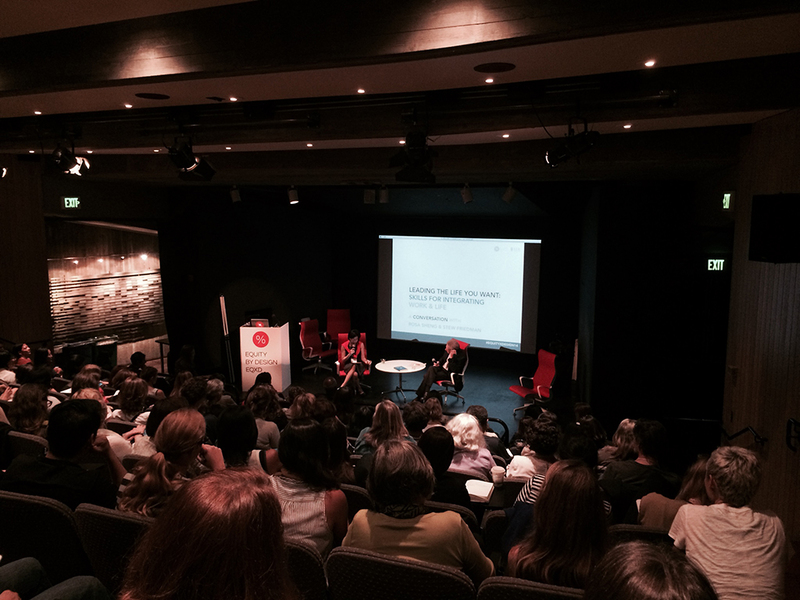 This panel discussion addressed the issues of why women (and men) leave the practice. Are they dissatisfied with the profession or just leaving the field to pursue a stronger interest? We identified many reasons: lack of transparency, lack of exposure to clients, lack of flexibility and lack of communication. The survey results showed that the timing of when women and men leave correlated with the main “pinch points”: Hiring, Paying your Dues, Licensure, Caregiving, and the Glass Ceiling. It is these pinch points and departure from the profession that has led to the lack of women leaders and women role models. The survey also displayed key elements of how both women and men define success, whether employees at a large architectural firm, sole practitioners or outside of architecture. Since we are all committed to Gould Evans, this was the one session our group did not attend! This session challenged participants to uncover multidisciplinary talents that could translate to additional revenue. We left this workshop with a range of new ideas for creative partnerships and ways to generate our own opportunities! This session focused on strategies and techniques for returning to the field of architecture after time spent outside of it. 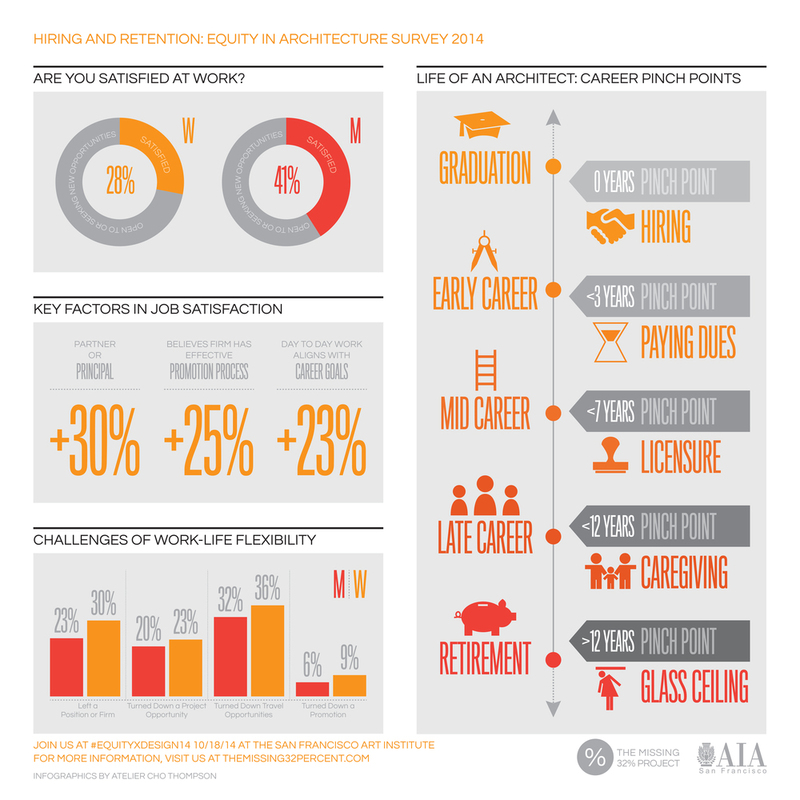 There are many factors influencing the decision to either leave the architectural field or be educated within the field and delay entry into architecture. For those considering leaving the profession for a sabbatical, to be a caregiver or to consider other vocational avenues, having a re-entry strategy and staying in contact with associates, clients and consultants may have great significance at a later and possibly critical time. Networking, staying connected through continuing education, and keeping in touch with trends within the field, changes to codes, etc. are all strategies that may help transition back to architecture. For employers needing to fill a niche with certain expertise, maturity and flexibility, consideration of re-entrants to the profession may be an ideal option. All in all, it was an invigorating and challenging day of interaction, information and dialog. For the last session, we were presented with a “Charlie Rose” style of interview between Rosa Sheng and keynote speaker, Stew Friedman. Stew challenged all of us to lead the life we want! To achieve work life integration, we needed to follow and develop three simple rules: Be real, be whole and last but not least, be innovative! As you can see, we were all smiles at the end of the day. This of course might have been because we knew shortly we would be sitting down at a table with some food and drinks to further discuss and ponder our day. Our bucket of knowledge was full. We are approaching this symposium as the beginning of the discussion of how we can influence our practice. The GE-M32 team will present more as we internally absorb and figure out our next steps. Until then!